Bartlett's Poems for Occasions, an entertaining, thought-provoking companion to the bestselling Bartlett's Familiar Quotations, is the book to turn to for any circumstance-from birth to death and everything in between. 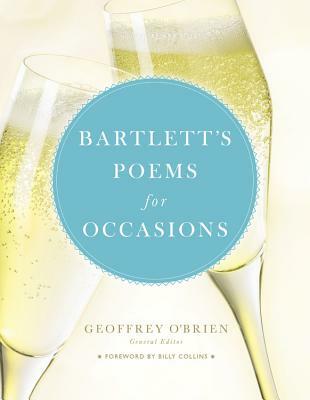 Under the direction of esteemed poet and writer Geoffrey O'Brien, Bartlett's Poems for Occasions will inspire you to turn to poetry to celebrate a new baby or marriage, toast a colleague, cheer a graduate, honor a birthday, deliver a eulogy, or add zest to a holiday party. It is the perfect solution to the age-old question, What should I say?